1. 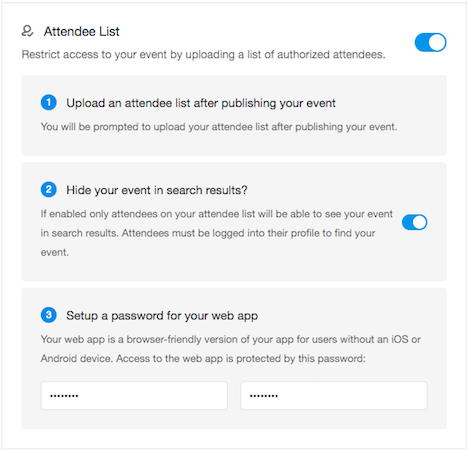 Attendee List - allows you to upload a list of attendees and restrict access only to those individuals. Note: This option requires users to go through an email verification process before joining the event (can be done without leaving the app). Optionally, you can hide your event in search results, so that only users from the list you pre-uploaded would be able to find it. 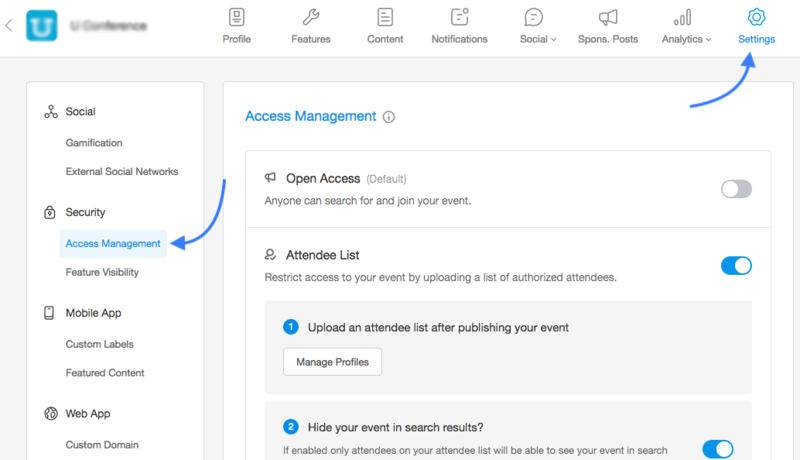 Note: With this feature enabled, attendees must be logged into their profile to find your event. As the web version of your app doesn't have any social functionality, including profiles, you need to set up a password to restrict access to it. Your web app is a browser-friendly version of your app for users without an iOS or Android device. 2. 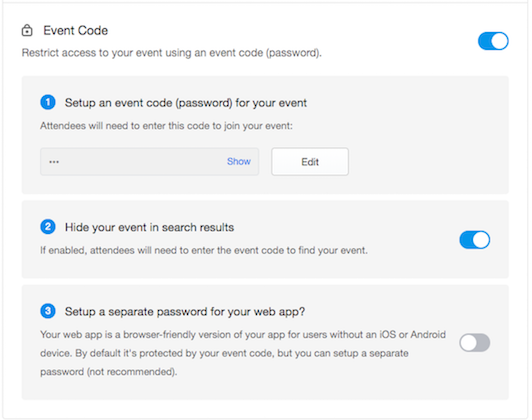 Event Code - a more simple way to keep your event private is to set up an event code (password) for your event. When joining the event, users will have to enter a valid event code. Optionally, you can also hide your event in search results. Users will have to enter a valid event code when searching for your event and won't be able to find it without the code. You can set up a different password for your web app, but this is not recommended. You can update those setting at any time, even when your event is already published. For the Attendify app please keep in mind that all users will need to verify their email addresses to access the app. After they make their initial account an email from support@attendify.com will be sent to them to verify their email. You can see an example of this below. Attendees will need to open this email and select the "Verify Email" button. This will verify their email. 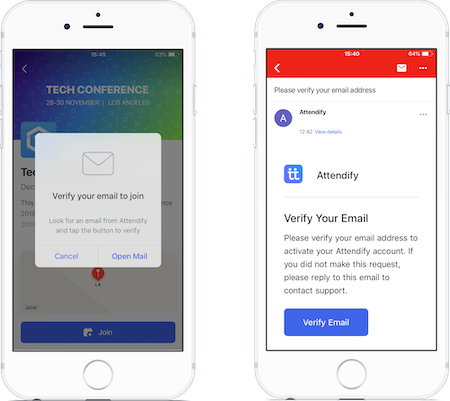 Please keep in mind this is a mandatory requirement for accounts within the Attendify App and it can only be verified via the email that is sent. It cannot be verified from your dashboard. If you have any questions about this please feel free to reach out to us at support@attendify.com or chat with us on any Attendify webpage.